Guest speakers at last week’s meeting were Callum Barley and Blaze Barker. They had come to talk to the club about RYLA – Rotary Youth Leadership Awards. RYLA began in Queensland in 1960 and has since spread around the world as a Rotary youth leadership program for 18—30 year olds. It has been organised in Tasmania for a number of years by the Rotary Club of Ul-verstone West. It takes the form of a week-long camp at Camp Clayton, Turner’s Beach. 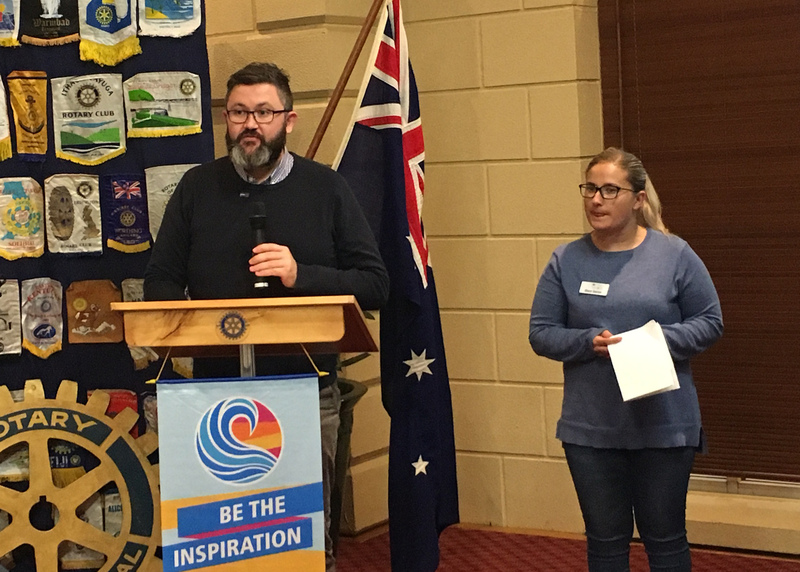 Callum was a member of the Tamar Valley Rotaract Club for a number of years and this year he joined the Rotary Club of Central Launceston. Callum has been a facilitator of RYLA for about seven years. He said the program attracts about thirty participants each year. 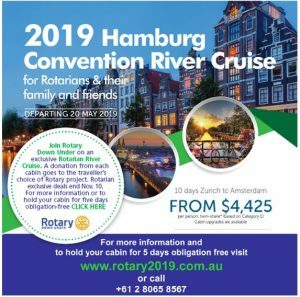 In the past, most participants have been nominated and sponsored by Rotary Clubs. However this is changing, with some now self-nominating and some sponsored by their employer. Callum said that so far, this year, nineteen self–nominated applications have been received. The challenge is to find sponsors for them. Some corporate sponsorship of the event is also received. Callum indicated that it costs around $50,000 to run a program. Blaze was a participant in the 2014 RYLA program. She was nominated by her employer, JBS Meats, and spon-sored by the Rotary Club of Longford.. Blaze said that when her employer nominated her for RYLA, she had never heard of RYLA or Rotaract. She was quite reticent at the beginning about attending, but shortly after arriving at the camp, she realized she had gained a whole bunch of new friends who were there to support and encourage each other. Her employer indicated that they had nominated her because they felt that she had the potential to advance in influence and seniority in the company. She felt quite unsure about this, but after attending RYLA she gained considerably in confidence. A highlight of the camp was the opportunity to sit on the beach, watch the sunrise and reflect on her life—it proved to be a very beneficial experience. Blaze said she was able to conquer her fears and participate in outdoor activities that at first she didn’t think she was capable of doing. This gave her a great sense of achievement and she valued the encouragement of the other participants. She really valued the inspiration of the speakers who addressed the group including a former coach of the St Kilda Football Club and Robyn Moore, a Tasmanian motivational speaker. Robyn encouraged those present to recognize their emotions and confront and eliminate the negatives. Since attending RYLA, Blaze has been promoted into a managerial position with her company, in spite of still being relatively young. She joined the Rotaract Club of Tamar Valley and has held the positions of president and secretary of that club. She also has been awarded a scholarship by Leadership Australia. Blaze said that she arrived at RYLA at a point in her life when she was feeling lost. The RYLA experience changed her life and gave her the ability and confidence to feel that she could tackle whatever she wanted to do in life. She said that her employer, JBS Meats, would be sponsoring another participant in this year’s RYLA program. Blaze said that at the conclusion of the conference, participants were invited to write a letter to themselves. This was mailed to them six months after the program concluded. Blaze said that she keeps it in her wallet and she refers to it from time to time as a source of inspiration. NOTE! Our club is currently considering an application for nomination and sponsorship of a delegate to this year’s RYLA program.